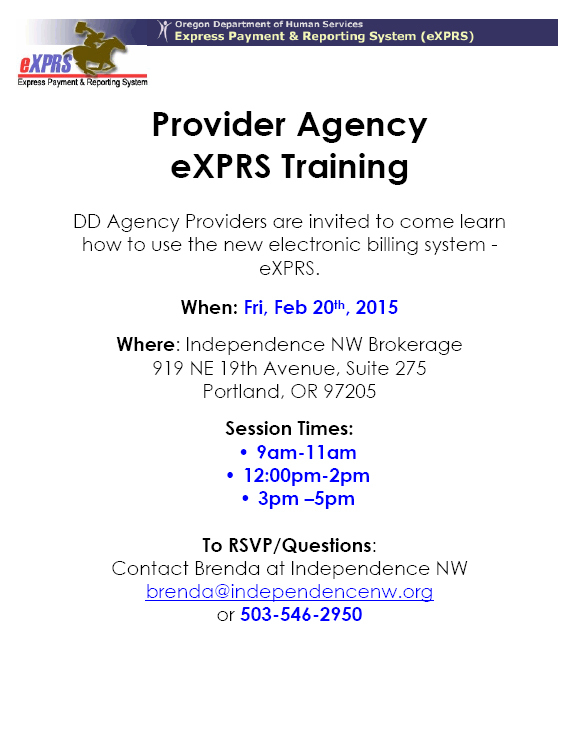 The Oregon Office of Developmental Disabilities (ODDS) will be offering three eXPRS trainings for Provider Agency staff at Independence Northwest on February 20th (9am, 12 noon, and 3pm.) Come meet with state personnel, see the eXPRS interface, and have your questions answered. Please RSVP by calling Brenda at INW at 503.546.2950 or by emailing brenda@independencenw.org! Join us for a DD Coalition GO! Project Legislative Advocacy Training, sponsored by Community Pathways Inc., Independence Northwest, and the Oregon Self-Advocacy Coalition. 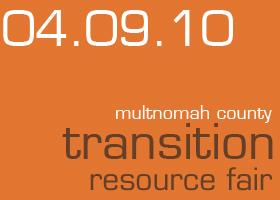 Please RSVP/Register by submitting your name, email address and zip code to info@oregonddcoalition.org. Are you currently paid to provide supports to an adult receiving brokerage services? If so, you are a Mandatory Abuse Reporter and have certain legal responsibilities. If you have reasonable cause to believe an adult with developmental disabilities has been abused, or that any person with whom you come in contact in your job has abused an adult, you must immediately report the abuse. Abuse includes but is not limited to: abandonment, financial exploitation, involuntary seclusion, neglect, physical abuse, restraint (not approved in a behavior support plan or by doctor’s order,) sexual abuse or verbal abuse. Report the situation to the Community Developmental Disabilities Program in Washington, Clackamas or Multnomah counties. This is required by law. In addition, you must immediately file a report with local law enforcement if you believe a crime has been committed. This is required by law. Write an incident report and submit it to the individual’s Personal Agent at Independence Northwest. 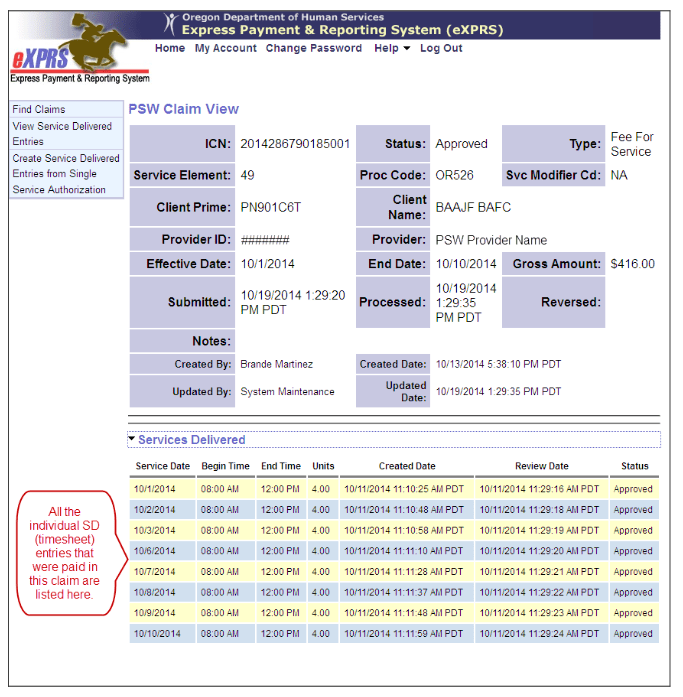 This is required per your signed service agreement with the INW customer(s) you serve. Please note: Mandatory Abuse Reporters are not limited to reporting only potential abuse and crimes against people with developmental disabilities. Reporters must also call in any issues involving, children, seniors (people 65 and older,) people with mental health issues and people with physical disabilities. You do not need direct evidence and it is not your responsibility or role to investigate the claim, but you have a legal obligation to pick up the phone and make a report as soon as possible. Additionally, you have a responsibility to report in writing/via phone to Independence Northwest when you have seen, heard or been told about the death of a brokerage customer; when there has been police, ambulance or fire department response; with regard to criminal referrals, medical hospitalizations, emergency room visits, psychiatric hospitalizations or any other incidents that are unusual for the individual/are of concern. You must do so within 24 hours of hearing of/witnessing the event. Click here to read a brochure on Mandatory Abuse Reporting in Oregon. Building Futures is for youth with disabilities and anyone who has an interest in supporting youth with disabilities as they transition from school to adult life. This includes Secondary Educators, Post Secondary Educators, Vocational Rehabilitation Counselors, Special Educators, therapists, counselors, service providers, job developers, and other rehabilitation specialists, and especially secondary students with disabilities and their families. Throughout this two-day event there will be presentations by regional and national experts on issues surrounding secondary transition, post-secondary transition, employment, higher education and assistive technology. If you would like to sponsor this annual event or receive more information, please contact Karen Ripplinger at: 503.581.8156 ext. 210 or kripplinger@oregonrisecenter.org. This workshop will identify the variety of economic issues that impact survivors of sexual violence. We will explore community resources, consider tools, provide information and problem solving so that attendees are able to strengthen their advocacy response to the needs identified by sexual violence survivors. This training is free of charge. Registration is required. Through September 18th, Future Horizons is offering a 25% discount to customers. Just enter the code BACK2SCHOOL when you check out. People First Connection is a a quarterly newsletter produced by and for self advocates. 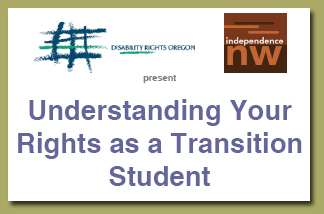 “The voice of self advocacy in Oregon.” Published by Self Advocates As Leaders. Steve Mussack will follow with recommendations for direct support staff and programs focusing on therapeutic practices on the milieu, increasing communication between program and therapy, and methods for support providers to feel supported. A panel presentation will be facilitated by Dr Mussack. The panel discussion will focus on community integration, job placement, legal issues, and overcoming neighborhood mentality. To register to attend this training, please visit our website at <http://www.otac.org/gro/training-registration?template=gro>. If you are registering five (5) or more people, please send an email to Jessica at jkaton@otac.org <mailto:jkaton@otac.org>. She will collect your information and register your group. You will receive an email confirmation containing the venue’s address and a link to directions, so please enter your email information. Registration will close on September 17, 2009. If you have any questions please contact Jessica Katon at 503-364-9943, x 41 or by email at jkaton@otac.org <mailto:jkaton@otac.org>. New to brokerage services? The Roadmap to Support Services is a great primer. The Roadmap is available in four languages: English, Spanish, Vietnamese and Russian. Thanks to Multnomah County DD Services for translation of this excellent resource into Vietnamese and Russian for our community. The Roadmap is a collaboration amongst Disability Rights Oregon (formerly Oregon Advocacy Center), Oregon Council on Developmental Disabilities and the Oregon Department of Human Services Seniors and People with Disabilities.